This is an open letter and proposal to Mark Zuckerberg, Facebook founder and CEO. 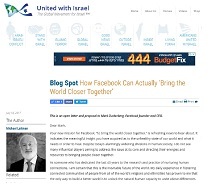 Your new mission for Facebook, “to bring the world closer together,” is refreshing news to hear about. It indicates the meaningful insight you have acquired as to the unhealthy state of our world and what it needs in order to heal. Despite today’s alarmingly widening divisions in human society, I do not see many influential players aiming to address the issue at its core and directing their energies and resources to bringing people closer together. As someone who has dedicated the last 40 years to the research and practice of nurturing human connections, I am certain that this is the inevitable future of the world. My daily experience in fostering connected communities of people from all of the world’s religions and ethnicities has proven to me that the only way to build a better world is to unlock the natural human capacity to unite above differences. So, when someone like you, who commands a major portion of humanity’s virtual infrastructure, declares bringing people together as a mission for the next decade, it gives me hope that we might just be able to orient the world towards unity with less chaos and suffering than could otherwise be expected. This is why I feel obliged to offer you my insight into the natural human capacity for connection and where the world is going in that regard. Your observation that the world’s challenges are global in nature and cannot be met by a single leader, country, or a top-down structure, is accurate. And this is just the tip of the iceberg. We are moving towards a perilous turning point in our social evolution: Current power structures are gradually collapsing before our eyes, while new ones are not yet in place. Politicians are losing their reins while growing increasingly detached from their people. In an interdependent world, current politics becomes an outdated game, as it necessitates its players to continuously immerse themselves in egoistic power struggles to maintain dominance. It is an environment that is simply unfit to safeguard the interests of the public, regardless of who the leaders are. In many countries, people see a broader and more pragmatic picture of reality than their political leadership and are beginning to raise their sights higher. In parallel, the current foundations of socioeconomics are shaking as automation and artificial intelligence are spreading through the workforce. As you well know, the jobs of the near future are uncertain and some form of a universal basic income is likely to become a necessity. With this, profound changes are expected regarding the notions of “work,” social class structure, and the collective ethos of Western culture. Under the hood, economics and politics are mere reflections of human relations. They represent what we give to and receive from society, how we make decisions and solve problems, how we distribute responsibilities and prioritize collective interests. It is the relationship between human beings across the planet that is on the cusp of evolution: Exploitive relations and self-centered perceptions are reaching maximum capacity; mutual concern and a more holistic perception will shape the world of tomorrow. As stated in your mission, we must empower people to build strong communities. To do that, we have to provide knowledge and guidance on how to continuously nurture and increase our capacity for human connection, in addition to providing the technological tools and infrastructure that help people organize. For instance, you have mentioned the importance of helping people find common ground before they approach their differences or aim to solve common challenges. We need to establish virtual communication practices that will encourage this. And just as people have gotten used to thinking about how many “likes” they got for their posts, they can get used to thinking about how much they made their community more connected. Seeing our common humanity is much like a muscle that needs to be trained. Today’s culture is numbing that muscle by pressing on our primal, egoistic impulses and perpetuating divisiveness. Therefore, community members should routinely work on strengthening their ties and maintaining a social climate of healthy, positive connections. To assist them, they also need collective measurements and feedback for their combined efforts to maintain a positive climate. Artificial intelligence could certainly be utilized to make the virtual community environment a facilitator of healthy human relations. In other words, it would be a virtual gym for community-building. From a global perspective, such positive Facebook communities could also serve as models to help us learn how to build our future society. As the world becomes more interdependent, people will have to expand their circle of concern. But preaching moral values no longer works. Instead, we need to enhance our social sensitivity, broaden our worldview, better understand our nature as human beings, and, most importantly, learn how to tap into our inherent wiring for human connection. I propose setting up a pilot program for the creation of a virtual community that is actively nurturing positive connections. Its members could be diverse people from all walks of life who would be interested in participating in such a social experiment. While there could be a vast array of features considered for future implementation, from my experience, I am certain that by simply following a few guidelines and communication practices, immediate positive results would be seen. As I’m sure you know, multiple fields of research have repeatedly shown that positive social connections make us happier, healthier, and better at what we do. I project that within a matter of months, participants in such a pilot program would experience similar positive effects in a noticeable way, which we could empirically measure. Should you be interested, I would be more than happy to collaborate in designing such a pilot program and share the experience I have gathered over many years, building a network of both physical and virtual communities joined by people from all walks of life.